Evelyn M. Witkin, born Evelyn Maisel (born March 9, 1921) is a United States geneticist who was awarded the National Medal of Science for her work on DNA mutagenesis and DNA repair. In 1944, Witkin spent the summer at Cold Spring Harbor Laboratory (CSHL). During her stay she isolated a UV radiation-resistant mutant of E. coli; this was the first time mutations conferring UV radiation-resistance were isolated. She returned to CSHL in 1945 and stayed there to complete her PhD research; her degree was conferred in 1947 and was employed by the Carnegie Institution to continue work at CSHL until 1955. Witkin then worked at the State University of New York's Downstate Medical Center in Brooklyn until 1971. Witkin was appointed Professor of Biological Sciences at Douglass College, Rutgers University in 1971 and was named Barbara McClintock Professor of Genetics in 1979, and then moved to the Waksman Institute at Rutgers in 1983. Witkin's research since the completion of her PhD was based on DNA mutagenesis, her mutagenesis work led to her work on DNA repair. By characterizing the phenotypes of mutagenised E. coli, she and colleague Miroslav Radman (at the time a post doctoral student at Harvard) detailed the SOS response to UV radiation in bacteria in the early 1970s. She continued to work on the mechanism of the SOS response until she retired in 1991. The SOS response to DNA damage was a seminal discovery because it was the first coordinated stress response to be elucidated. For her insightful and pioneering investigations on the genetics of DNA mutagenesis and DNA repair that have increased our understanding of processes as varied as evolution and the development of cancer. In 2015, she was awarded The Wiley Prize in Biomedical Sciences. Witkin won the 2015 Lasker Award for Basic Medical Research, with Stephen J. Elledge, "for discoveries concerning the DNA-damage response - a fundamental mechanism that protects the genomes of all living organisms." Also in 2015, she was named as one of The Forward 50. 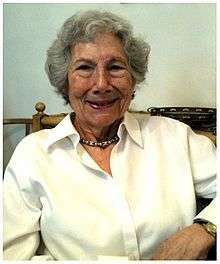 Evelyn Witkin was married to psychologist Herman A. Witkin; their children include Joseph Witkin, an emergency physician and founding member of Sha Na Na, and Andrew Witkin (d. 2010), a computer scientist. She is also the grandmother of four. 1 2 3 Gross, C. A. (2001). "The 2000 Thomas Hunt Morgan Medal. Evelyn M. Witkin". Genetics. 157 (2): 459–461. PMC 1461505 . PMID 11370620. 1 2 Sweasy, J. B. (2004). 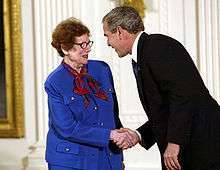 "Evelyn M. Witkin Awarded the National Medal of Science". Radiation Research. 161 (4): 493–494. doi:10.1667/3150. PMID 15038781. 1 2 Lasker Foundation. "2015 Winners Albert Lasker Basic Medical Research Award". Lasker Foundation. Lasker Foundation. Retrieved 8 September 2015. ↑ Gitschier, J. (2012). "It Was Heaven: An Interview with Evelyn Witkin". PLoS Genetics. 8 (10): e1003009. doi:10.1371/journal.pgen.1003009. PMC 3469448 . PMID 23071456. ↑ Witkin, E. M. (1976). "Ultraviolet mutagenesis and inducible DNA repair in Escherichia coli". Bacteriological reviews. 40 (4): 869–907. PMC 413988 . PMID 795416. ↑ "Book of Members, 1780–2010: Chapter B" (PDF). American Academy of Arts and Sciences. Retrieved July 29, 2014. ↑ Bridges, B.; Walker, G. C. (2004). "Presidential Honor for Evelyn Witkin". DNA Repair. 3 (5): 453–454. doi:10.1016/j.dnarep.2004.01.013. PMID 15084307. ↑ November 11, 2015 (2015-11-07). "Forward 50 2015 –". Forward.com. Retrieved 2015-11-11.